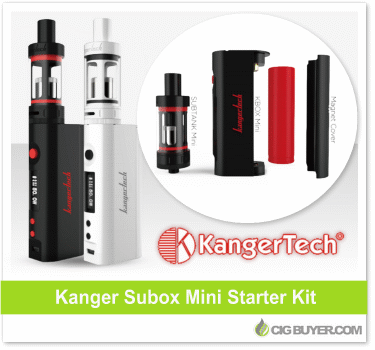 The Kanger Subox Mini Kit is one of the HOTTEST PRODUCTS of 2015! It includes the brand new Kangertech Subox Mod with a Kanger Subtank Mini – in matching colors. Available in black, white or blue, it has a beautiful, designer look and comes with everything you need to get started; just add a single 18650 battery. The Kanger Subbox is a compact, VW mod and fires up to 50W, with a minimum resistance of 0.3 ohms. The tank comes with two OCC coils (0.5 and 1.5 ohms), adjustable airflow and improved RBA head for DIY’ers.